DO I QUALIFY? CYBORG? …I THINK SO!! for Letraset Corp.'s International catalogue in 1990. Little did I suspect what lay in store! 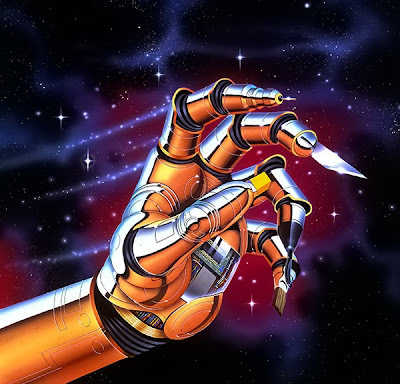 piece I did for the Atari Lynx System…By hand. Controlled Devices, I have to consider my Mac, Adobe, Photoshop, Illustrator, and all the other keystroke and Wacom aided waving about of hands and feet and brain to generate illustration these days to be C.C.D.s, agreed? That leaves only the vital word 'VITAL'. Hmmh, ...I think it is certainly vital to me to not be slinging burgers at Mr. Box's place for a living, as sadly are some of my aging contemporaries. So yeah, I'm all about being all things CYBORG. For the largest part of my career, and certainly during the era I did game art, I actually produced illustrations you could hold in your hands and admire. Today all my work enters life as data, in all of its freeform, lightly floating, in the cloud, easily transmitted glory. in 2003, using strictly Photoshop. What it is NEVER, however, is TANGIBLE. 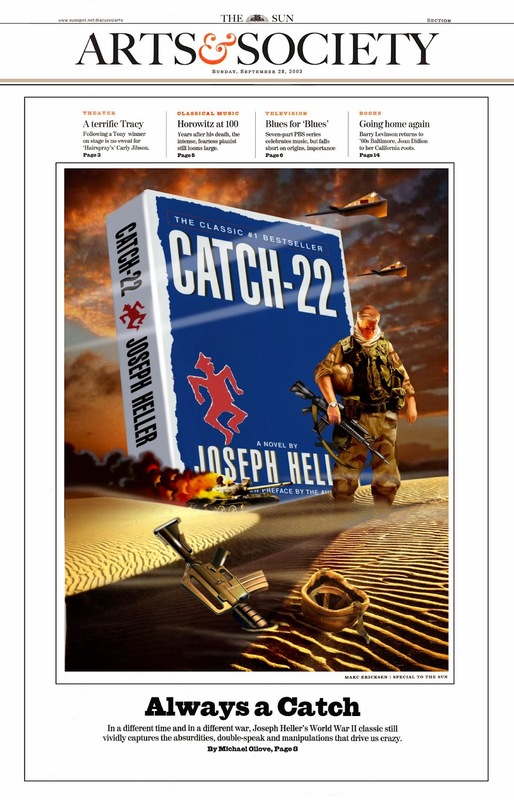 sure, you can run a print., but so can everyone else. In my capacity teaching Graduate level Illustration classes at The Academy of Art University in San Francisco, I have been confronted with extremely talented young adults who have grown to adulthood in a world where the majority of their efforts in art have been conducted on an electronic surfaces. My most recent class requested to see some of my Twentieth Century art, and I was persuaded to bring in several of my airbrushed pieces, and I was delighted to see a connection occur. The students seemed transfixed by the tangible nature of the materials, and were full of questions about the processes, techniques and materials we used to use as illustrators. They are incredibly talented at sketching directly on their E pads, and of course, draw diligently in their old world sketch pads, but for some reason, the connection with manually rendering in full color the finished illustration for what could be a very complicated image seems beyond their view, but certainly not beyond their talent. In their (perfectly legitimate) world, they can drag and drop mountain ranges, billowing cloud forms, tempestuous oceans, towering cities, beautiful sunsets, as long as they are careful not to step on an originator's copyright. To them, the idea of facing a blank canvas, and creating all those sorts of things from scratch seems to some of them confounding. In the end however, in their own venues, they are using their talents to create magnificent imagery, aided by their computers, and in sync with a vast array of visual reference at their fingertips, that to illustrators of my era would have seemed simply an impossible dream. OKAY, IT'S 1996: CYBER UP, OR GET OUTTA DODGE. 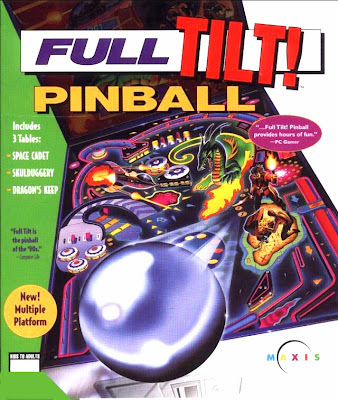 MAXIS CALLS WITH FULL TILT PINBALL. 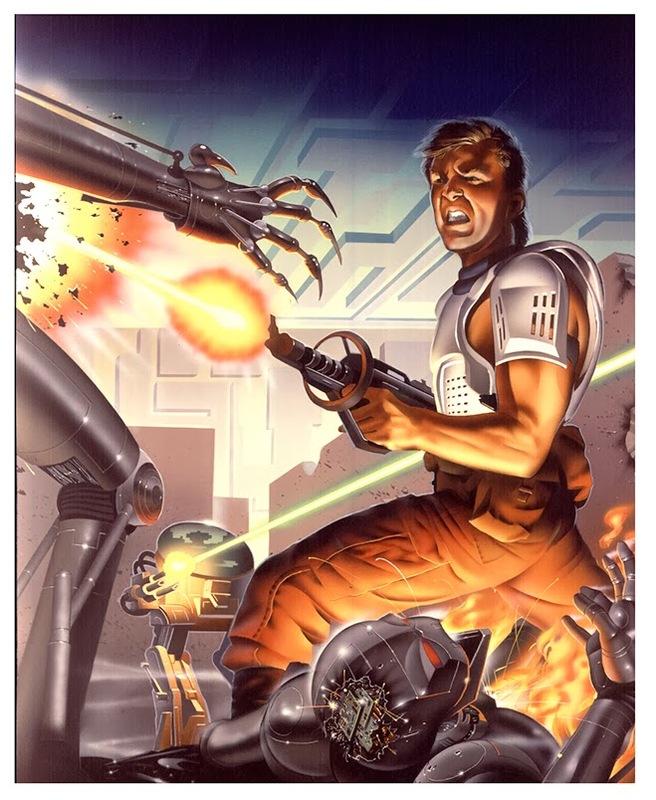 So for me, the time came when it was "Dude, put away the airbrush, we need the art in layers". This was actually a 'Bridge' piece for me. 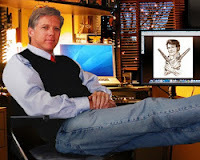 My techno savvy studio mate Robert Evans was tutoring me in Photoshop, which had been around since '90. I was trying hard to grasp things, and I took on this piece for Maxis. I wound up airbrushing it and dragging it into PS to do the detailing , and thereby learned a great deal. Soon my hand was more rapidly forced, as agencies saw the benefits in receiving their art in a form they could much more easily manipulate. 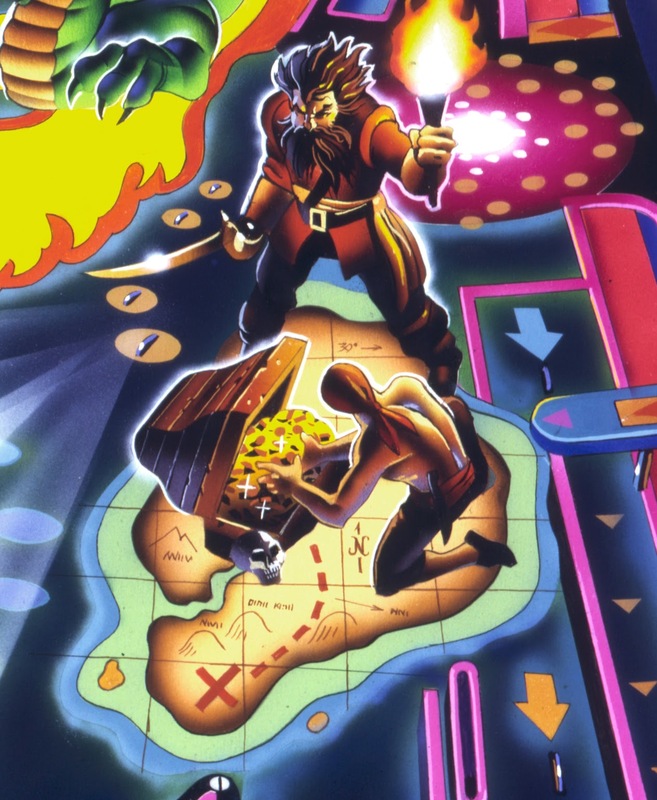 Which I needed to do if I wanted to keep illustrating, The imagery and gameplay for video games were reaching a critical mass for the concept that they could be used as cover art for the game boxes themselves. It was that concept that drove most of us out of the market. It was also that impetus though that allowed me to continue as a freelancer in the Bay Area, working in Photoshop as I have been doing in the intervening 20 0r so years, doing packaging art, technical art and presentation art for the advertising market outside the gaming industry. 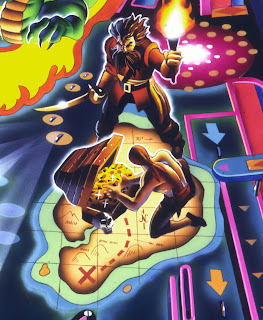 The Gaming art was the most fun, and most rewarding era of my long career as an illustrator. During that period I met and worked for some of the most forward looking and creative people imaginable, and had a blast doing it. I can't imagine having a career be any more fun. I wanted also to give a shout out to Bryan Belcher and his Half Empty Tank group effort in launching his second Mega Man-a-Thon marathon promotion Jan. 2-5, at MAGfest12, contributions for which will go to help Child's Play, an organization dedicated to get game gear to hospitalized children. I will be donating 10 signed prints of my original Mega Man 2 illustration I did for Capcom back in 1989. THANKS FOR GIVING ME YOUR VALUABLE TIME, I HOPE YOU HAVE ENJOYED IT! !